It's Mental Health Week and yet there's not a lot of media coverage, particularly in the mainstream. (ABC2 has had some good programming). There's a hidden epidemic, that of suicide, particularly amongst males. Despite much more awareness today, with help at hand, people and the media in particular, barely use the word at all. When I was working in News, it was policy not to report suicide stories. Is this right? Should we be sweeping it under the carpet? There are approximately 2000 men who commit suicide in Australia every year (2,292 in 2015). With a population as small as ours, its a shocking figure. It's bad for women too, approximately 700. (Overall in 2015 - 8.3 suicides per day). There is a lot of public awareness now regarding the rights of women, domestic violence, breast cancer etc. This is a great thing, yet there's very little said about men at all. Prostrate cancer kills more men than breast cancer does women. Yet there's limited media coverage about it. One in three women suffer domestic violence in their relationships. A terrible statistic and its great to see commercials targeting this issue, and politicians talking about it. Yet, one in every second man is a victim of male instigated violence. One in three is also a victim of domestic violence. There is nothing said about it. (Excluding school yard scraps, I've been assaulted twice as an adult for next to no reason, one put me in hospital for a week). I feel sorry for young men today. They don't know what they're supposed to be. They certainly know what they're not supposed to be, but there's nothing that says, it's okay to be a man, to be masculine, to express your feelings etc. There's so much man bashing going on in the populous media and social media that even men are joining in simply to be accepted. It's political correctness with half a face. "... few preventive efforts or policies specifically targeting male suicide have been developed or evaluated, which further contri­butes to its lack of visibility as a major public health problem." 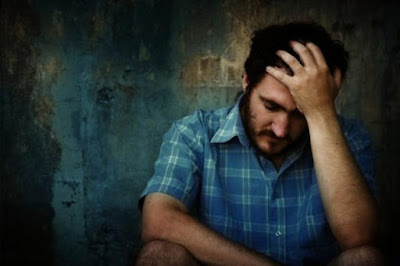 http://www.bcmj.org/articles/silent-epidemic-male-suicide This is a very good article from a medical journal. Sadly it's five years old, which means nothing has changed. I'll say it again. Depression and anxiety does not discriminate. Yet men are often demonised for simply being men. They're caught between a rock and a hard place, having to take on gender guilt for the sake of a few bad apples. A lot of change needs to happen in our society. We need to stop referring to the races and sexes and peoples sexual choices as individual areas of concern, and start thinking about the well being of human beings in their entirety, from children to the elderly. This casual discrimination and ignorance must end. In closing, I wanted to mention that the artistic world lost a great talent on Sunday the 9th of October, ironically during Mental Health Week, the death of 26 year old Fergus Miller from Melbourne. He had depression. He committed suicide. He was the creator of the band Bored Nothing, among other things. What a tragedy. On the eve of 2013, Bored Nothing scored a Next Crop acknowledgementfrom triple j and in August 2014, released a second album, Some Songs, (the first in 2012), which we featured for AusMusicMonth that year. Richard Kingsmill spoke to Fergus at the time, after he'd finished touring Europe, playing 26 shows in six weeks, discussing his influences and songwriting process. "When I started writing music I was writing it was a lot more with rhythm than with melody and it took me quite a few years to get over that. I think once I really grew an appreciation for that kind of stuff I went back to my roots and listened to a lot of The Beatles, Velvet Underground & Nico, stuff like that." During his career, Fergus toured with internationals like Best Coast, Beach House and JEFF The Brotherhood as well as many locals that he struck up close friendships with, including John Steel Singers, Bleeding Knees Cluband Step-Panther. One of my best friends committed suicide when he was only 21. I'm sure you know someone who has committed suicide too. Let's start talking. And let's start caring. It is a huge issue. Mental health issues can be so messy - everyone seems to be different in how they handle/don't handle them. One facebook buddy has been detailing his change of medication and his subsequent meltdowns and frequent trips back into hospital. You wish you had the magic words or solution for him to get better. He fortunately gets a lot of support from his huge group of facebook buddies. It is surprising how many writers that I know online have depression. At least they talk about it, especially the males. A tough scenario no doubt. My point is that there should be more widespread awareness and media coverage. Let's not priotise one over another. It should not be covered up, especially for men, who for generations have been told to 'man up' 'grow some balls' 'men don't cry' yes they do and as a depression sufferer myself, i realise its talked about for women but not nearly enough and talked about even less for men. When i was undergoing councelling, i shared a waiting room with 2 men, one a long serving police officer who had witnessed the death of a little girl, it broke him and a fireman who had witnessed the death of one of his own. They were broken men, i realised that day, as they sat backs straight, pretending nothing was wrong, mental health needed to be brought out into the open for both women and men, more so for men. It is ok to feel broken, it helps the healing to talk, it helps non sufferers to understand, if only a little more. It's a first that our posts line up so neatly, given this messy, messy world. I love you, my friend. Thank you for publishing this. Thanks for commenting Hel. Actually I did see that episode, it was very powerful. Hopefully we'll see more of these types of programs, and hopefully some more visibility in our populous media.